Haddonfield Troop 64 Scouts give their sled a shake before the start of the Klondike Derby. 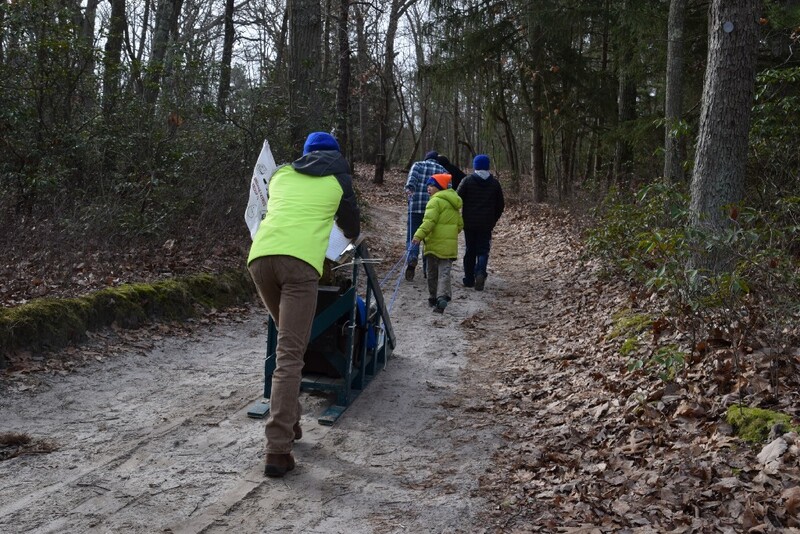 On Jan. 28, with a scattering of snow flurries falling from a slate gray sky, more than 200 Boy Scouts and Webelo Scouts from the White Horse District converged on Pine Hill Scout Reservation. They were there to test their Scouting prowess, to see how well they could work a compass, work a knot and, most importantly, work together. They were there for the Klondike Derby. 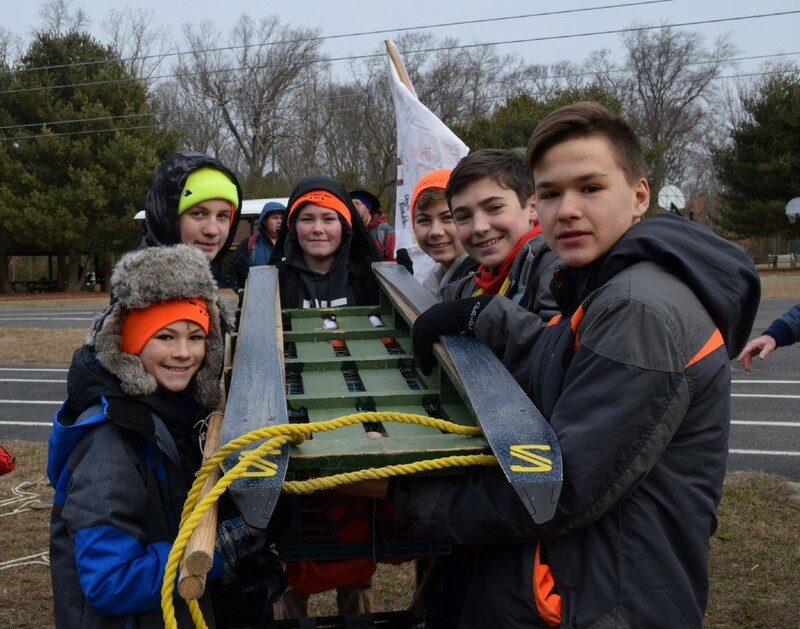 Equipped with handmade wooden sleds laden with supplies, decorative team flags and boisterous chants, the 26 teams hailing from 18 Boy Scout Troops and one Cub Scout Pack took on nine challenges across the reservation, from orienteering to wilderness survival. 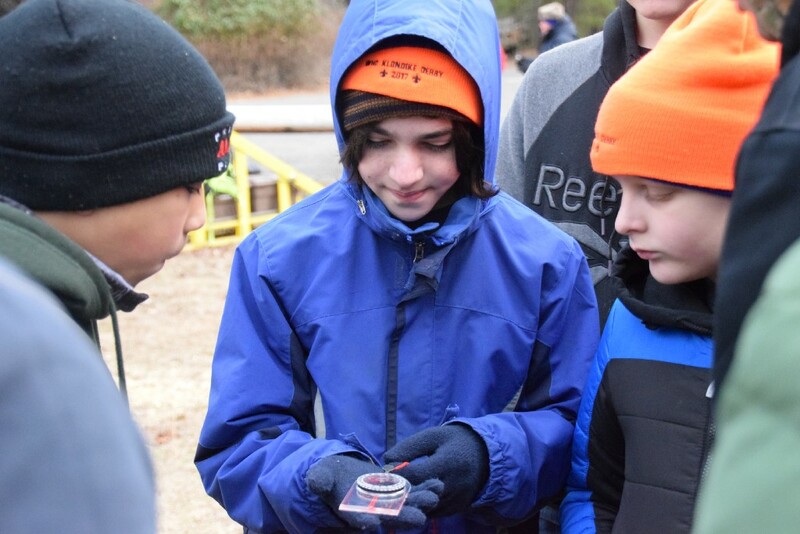 Scout Daniel Cohen adjusts his compass for the orienteering challenge as fellow Cherry Hill Troop 70 Scouts Ronin Karnofsky, left, and Dylan Anderson follow along. According to the Boy Scouts of America’s “Scouting” magazine, the first Klondike Derby was held in 1949. 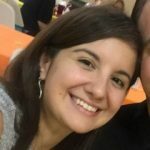 While it’s not known when the event made its way south, many of the 75 adult volunteers at this year’s derby agreed it’s been a longstanding South Jersey tradition. Mike McCormick knows the local Klondike Derby has been held for at least 23 years. McCormick has been the Berlin Troop 48 Scoutmaster since 2009, but his history with the troop far predates his leadership role. He joined Troop 48 as a Scout himself in 1993. Members of Cherry Hill Troop 70 make their way through the woods on the Pine Hill Scout Reservation. He said this year’s derby had a number of new challenges and events, making the Scouts think on their feet, and the entire event — from planning to participation — was a positive experience. One of the Troop 48 patrols did better than just improving over last year’s score. The team of 15-year-olds John Walker and Magnus Pascu and Steven Chiasson, 17, won the derby. The trio was an uncommon team — typically each sled has six to eight Scouts. 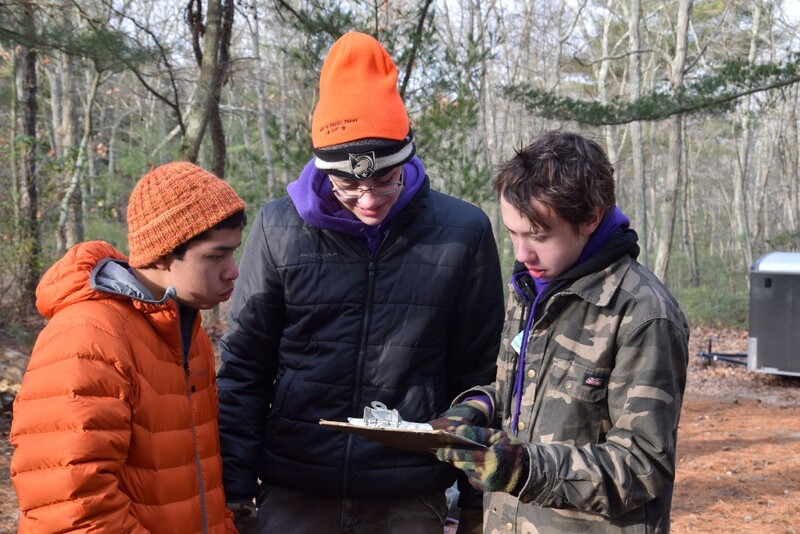 Berlin Troop 48 trio, from left, Steven Chiasson, John Walker and Magnus Pascu plan their strategy in a teamwork challenge. The team won the Klondike Derby. Ronan Carthy has been with Haddonfield’s Troop 64 for about four years. The troop has participated in the Klondike Derby for a number of years, but this was the first the Scouts camped overnight. 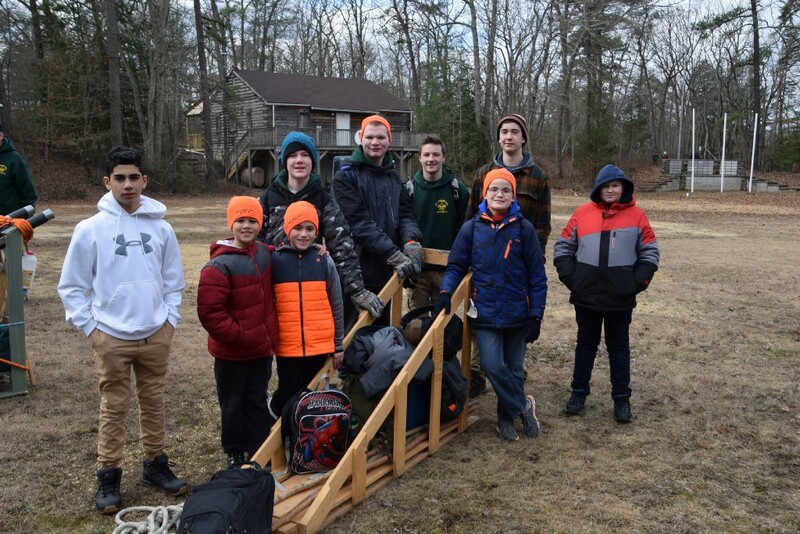 Cherry Hill Troop 70 Scoutmaster Ron Lewis noted teamwork, communication, leadership and reinforcement of skills as important components of the Klondike Derby — in addition, of course, to having fun. Cherry Hill Troop 252 Committee Chair Lee Girer said, from an adult perspective, seeing Scouts from 12 to 17 years old work together as a team is gratifying and shows efforts at teaching good citizenship and teamwork are working. While he admitted it’s more fun with snow on the ground, Cherry Hill Troop 70 Scout Piercson Sheehan, 16, said the event was still a good time. Fellow Scout Daniel Morgan, 16, agreed. Vince Teti, with Berlin Troop 48, also noted the event is a test of Scouting skills. The 14-year-old ran courses for a couple of years before participating. This was his third year competing in the derby. 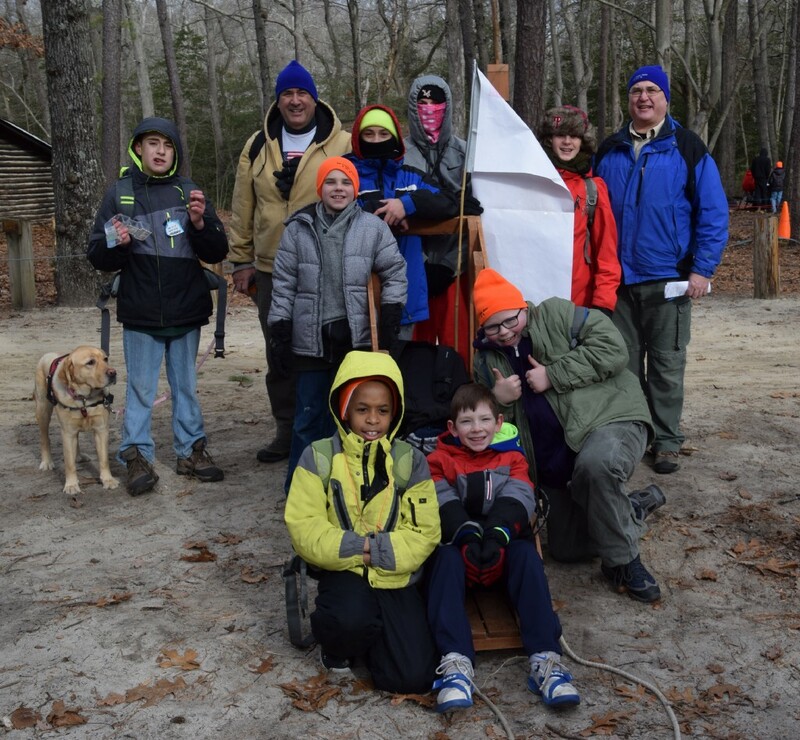 Cherry Hill Troop 252 Scouts, from left, Ryan Cherfane, Isaiah Ashlock, Julian Dappolone (front), Aidan Folcher, Eric Slim, Nikolas Vasiliadis, Jacob Bornyasz, Matthew Douglass (front) and Andrew Souza stand with their sled before they begin their orienteering challenge. Fun seemed to be the recurring theme at this year’s Klondike Derby, and it was evident on the Scouts’ faces as they mushed through the woods from one challenge to the next. And even though each team competed on its own, there was an overall sense of camaraderie around Pine Hill Scout Reservation throughout the day. Below, Cherry Hill Troop 166 takes a breather as they wait for their score. Clockwise from left: Jimmy Martin with his service dog Mercy, Assistant Scoutmaster Jeff Martin, Charlie Shelton, Stephen Welsh, Sean Welsh, Nick Kassekert, Scoutmaster Glenn Welsh, James MacCarthy, Joshua Smithson and Jonathan McLaughlin. If you’re a boy ages 11 to 17 and are interested in joining the Boy Scouts, visitwww.beascout.org and enter your zip code to find a local troop.